There are too many tourist attractions in Kyoto and if you don't have enough time, it probably makes you confused where to go. Even though you don't have enough time, I would say wherever you go Kyoto is beautiful. So do not be greedy and feel Kyoto yourself. I will take you to walking tour from NISHIYAMA RYOKAN. Here is one of the best places for cycling or walking. If you would like to feel Kyoto, it is essential to go. It is also popular spot for Kyotorian couples at night . This shrin is not famous for tourist spot but I like this kind of place. It is calm and there are many big trees. When you are tired of moving arond Japan, how about refreshing in the nature? If you find a good one, feel free to let us know! Ichizawa hanpu is famous Kyoto brand for bags. They have many different designs. Yasaka shrine is just around the corner of the bag store. This is one of the famous shrines in Kyoto. Red color is very beautiful. It takes 30 to 40 minutes to Yasaka shrine from our ryokan. After praying Yasaka shrine, I recommend you to go to Kiyomizu temple. I didn't go this time because I didn't have enough time. I will go there another time and post the blog! The Jidai Matsuri is one of Kyoto's renowned three great festivals. about 1,200years ago,the Emperor Kammu chose Kyoto for new capital. this decision made on Octorber 22 in the year 794 was the biginning of Kyoto. we celebrate Octorber 22 with a grand festival. The highlight of this festival is a procession of colorful and varied costumes . the parade start from Imperial palace and walk to Heian shrine for 2and half hours. please come to see this festival for next year on 22nd of Octorber you can enjoy this festival near our ryokan! One of my favorite things to do on my day off is now cycling. 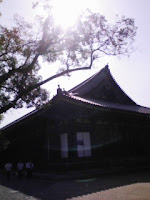 This time, my final destination was Sanjusangen-do which is famous of 1001 of statues of Kannon. It takes 1 and a half hour to get to Sanjusangen-do from my house. It is far. I stopped by Kyoto station to take a rest and have a quick lunch. 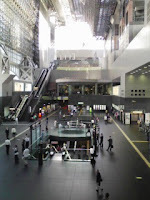 Kyoto station is the first destination for the travelers who arrive Kyoto. It is always busy with lots of people and foreigners but it was a week day, so there was less people than usual. I took this picture from cafe. I like sitting there to watch people. If you come, find where is it! After having a rest, I left for Sanjusangen-do. It took just 10 minutes from Kyoto station. front of the building. If you are interested in 1000 statues, just go and see. Best season of Kyoto is Autumn . During middle of November to beggining of December Kyoto is very very busy because there are lots lots people come to visit Kyoto for KOUYOU(colored leaves). all leaves turn in autumn and this is very beautiful to see with temples and shrines. during Autumn there are many night time lights up and many events. If you still thinking when you are going to visit Kyoto. I recommend come here KOUYOU season ! Autumn makes me excited for no reason. I feel like going out somewhere else! 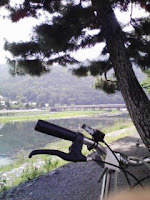 So, I went to Arashiyama which is one of my favorit places in Kyoto by bycicle. It was still bit hot, but sitting on the bench in the shade along the river gave me refreshment. You can see the bridge in the photo below ( really small though) which is called Togetsukyo and this is a landmark in Arashiyama. There are lot more other attractions here, for example beautiful bamboo groves, Tenryuji temple recored by World Heritage Site and Sagano Romantic Train.